Two-channel aficionados seek pure, unprocessed sound and often find it only in analog components and vinyl recordings. By comparison, the very essence of home theater is digital signal processing and decoding – the two are often seen as incompatible. As a result, it is not unusual for serious enthusiasts to have two entertainment systems: a pure two-channel system, and a dedicated home theater system. Until now, this is often thought to be the only way to get the best of both worlds. The Parasound Halo P 7 shatters this myth and introduces an elegant way to get the best of both worlds from one single device. The P 7 is an analog control amplifier from Parasound's flagship line of Halo components. It is designed to be the centerpiece of a high-end stereo system as well as a control center for a multi-channel home theater system. The P 7 is both a two-channel pre-amplifier and a multi-channel control pre-amplifier. As a two-channel component, the P 7 has seven RCA analog inputs, including a switchable moving magnet/moving coil phonograph input and a tape loop for analog recording equipment. It also features left/right balanced-line inputs (balanced-line connections are important for a lower noise floor and longer cable lengths) for a CD player or other component equipped with XLR outputs. The P 7 also has dual eight-channel analog inputs, one set for a multi-channel source component (e.g. Blu-ray player with Dolby TrueHD and DTS-HD decoding and analog outputs, or an SACD/DVD-A player) and the other set for connection to a home theater system. Other features include analog bass management for two-channel and multi-channel, an input renaming function (very useful for switching between stereo and home theater), headphone level, maximum volume setting, balance and tone controls, trim controls for speaker levels, and an input assign mode for linking the pre-amp with Parasound's optional HDMI video switcher. The setup menus are simple, and the blue front panel display lights are clear and easy to read. The first method uses a separate two-channel power amp for the front stereo channels and an existing AV receiver to power the center and surround and/or surround back channels. In this configuration, the front and subwoofer pre-outs of a home theater receiver connect to the front and subwoofer multi-channel inputs of the P 7. The front amp outputs of the P 7 before connecting to a two-channel amplifier to power the front stereo speakers, and the sub output is connected to a powered subwoofer system. The receiver's surround (surround and surround back channels) and center channel amps power the rest of the system. The second method uses an existing AV receiver and either a two-channel amp for the stereo speakers and an additional three or five-channel power amp for the rest of the system. In this scenario, the pre-outs of all channels of the receiver are connected to one of the multi-channel inputs of the P 7, which then connects to outboard power amps. 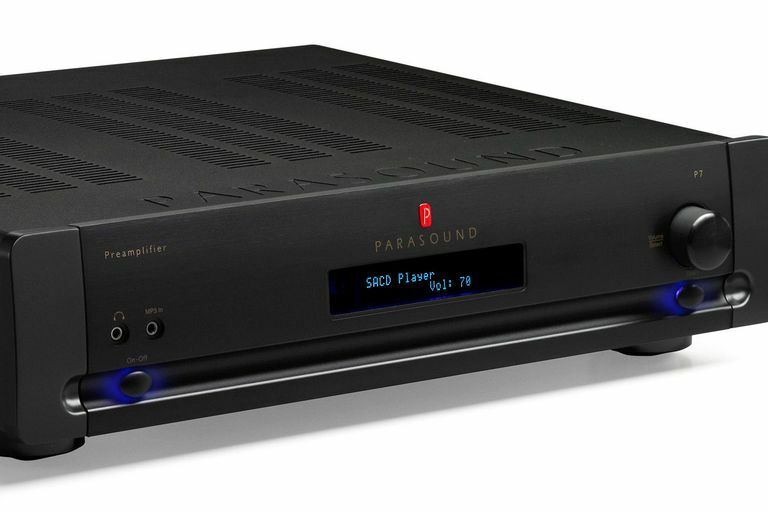 In both setups, the Parasound P 7 handles the two-channel analog signal, and the receiver handles the digital audio and video signal processing. Both connections methods use the Theater Bypass Mode in the P 7 for home theater listening. When Theater Bypass is activated, the pre-amp outputs of the P 7 are fixed and the receiver's volume control is used to adjust playback level. The Theater Bypass mode affects only the multi-channel inputs of the P 7. When listening to two-channel sources the P 7 volume control is used. Although these descriptions may sound a little awkward, the actual implementation is simple and straightforward. In both examples, stereo reproduction is optimized and home theater can easily be integrated into the system. The best amp and speakers are used for pure stereo reproduction and the receiver handles digital processing for home theater sound. It's an elegant solution and provides the best of both worlds in a single home entertainment system. Setup method two was chosen for evaluating the Parasound P 7. We connected the pre-outs of a Yamaha 5.1 channel AV receiver to one of the multi-channel inputs of the P 7, and the pre-amp outputs to a Parasound 5250 five-channel power amp. We connected the multi-channel outputs of a Blu-ray player to the other multi-channel input on the P 7 (because the receiver doesn't have Dolby TrueHD and DTS-HD audio decoding). The output of the player is fixed, so we activated the Theater Bypass Mode on the P 7 to allow the AV receiver to control the volume. This setup uses a boat-load of cables, but it's actually easy to connect. The P 7's well-written owner's manual includes easily understood explanations and connection diagrams. It may be news to two-channel newcomers (old news to music lovers) that vinyl recordings have been making a comeback. Some artists are selling vinyl-only releases of new recordings or offering them in both CD and vinyl simultaneously. With that in mind, the first audition of the P 7 was its phono stage using a recently-reconditioned Thorens TD 125 MKII turntable with its fabled Rabco SL-8e linear tracking tonearm sporting a Denon DL-160 high-output moving coil cartridge. The Rabco tonearm is a fussy device, but when working well, it has outstanding sound qualities, particularly when complemented by the Parasound P 7's excellent phono stage. The phono stage of the P 7 alone makes it a component worthy of praise. An original master recording of Linda Ronstadt's What's New sounds better than the DVD-Audio disc of the same recording. Ronstadt's dynamic voice has soundstage depth that we haven't heard on the DVD-A recording of the same album. At the risk of sounding like audio snobs, the vinyl has more air and space around her voice than the digital disc. We attribute this partly to the quality of the recording; but only a clean, accurate phono stage can bring out the finer qualities of a good vinyl recording. When used in a home theater system, the Parasound P 7 is mostly a pass-through component. However, many of its controls and adjustments are designed for home theater listening. The subwoofer trim and front-rear balance controls are helpful for adjusting sub level and speaker balance in a home theater system. Although we enthusiastically recommend the P 7, we also recommend caution when adjusting volume. The volume control can be raised very quickly, needing only a quarter turn. The absence of detents lacks the tactile feel that helps the user gauge the level of volume increase. We nearly damaged a pair of very expensive speakers by inadvertently increasing the volume while not looking at the front panel display. A user error to be sure – it's not a reason to overlook the P 7, just a cautionary note. So for some, it may be wise to use the P 7s maximum volume function. One of the biggest challenges faced when writing reviews is resisting the temptation to buy everything that exceeds expectations. The Parasound P 7 is a case in point. We enjoy pure two-channel sound as much as a dynamic home theater, and the P 7 makes it simple to have the best of both worlds in one system. If we seem favorably impressed, you're correct. Part of the thinking behind the Parasound P 7 is that speakers that sound good in a two-channel system will also work well in a home theater system, which is generally true. Important sonic characteristics, such as clarity, dynamic range and headroom, and transparency, are desirable in stereo and home theater systems. The P 7 delivers on all counts, making it a top pick. Dimensions (W x H x D): 17 ¼" x 4 1/8" (w/feet) x 13 ¾"